I remember one Christmas watching several episodes of Ken Burns’ documentary series, The West. I didn’t really know much about the subject matter, bar the usual stuff you pick up in movies and comic books. I didn’t know anything about Ken Burns. In fact, it was probably several years before I realised that Ken Burns was behind the programme. And that was after picking up the book of the series and everything. I’m not that observant, I guess. But one thing I did pick up on and did remember, was the story of Joshua Norton, the self-proclaimed Emperor of the United States and Protector of Mexico. I won’t go into great detail about his story, it is better documented elsewhere, but to give a brief overview – Norton was born around 1819 in England, possibly London. As an infant he and his family moved to South Africa. In 1849, with $40,000 inherited from his father, he emigrated to the United States, settling in San Francisco. He was a successful businessman, multiplying his $40,000 several-fold, but came unstuck after an ill-advised investment in Peruvian rice. By 1858 he was declared bankrupt, and left the city. When he returned, things got interesting. He declared himself the first Emperor of the United States, and soon afterwards the Protector of Mexico. As far as he was concerned he had absolute control over the country and he issued decrees on all manner of matters of state. He held himself like an Emperor too, wearing a fancy outfit he would examine the city and make declarations to anyone who would listen. He would even issue his own currency. He was ignored, initially. But soon the city took him to their hearts. They played along with his delusion. He was penniless, yet was guaranteed a seat at the best restaurants and theatres. The census listed him as an emperor. People even started using his currency. When he died the great and the good paid for him to have a suitably lavish funeral, and 30,000 people lined the streets to pay his respects. It is a fun story, but also a little troubling. Here was someone who essentially willed themselves into fame. Emperor Norton feels in some way like a precursor to modern-day celebrities who are famous for being famous, or those people who seek out fame for fame’s sake. Fame isn’t necessarily a bad thing – wanting recognition for talent or effort feels quite reasonable, but what of those people who become well-known for other, less tangible reasons? This is also a story of mental illness. Was San Francisco truly understanding of someone who had most likely gone through some sort of nervous breakdown? What was the motivation – kindness, humouring him to avoid conflict, or something darker? The restaurants who gave him meals saw an upturn in business, for example. Are such figures useful for us – as entertainment, or something else? Even now, many people we place in the public eye seem emotionally and mentally vulnerable, and this is what perhaps makes them compelling figures. Do the unstable make good celebrities, or do celebrities become unstable? Maybe a little bit of both, but there feels like a line can drawn from Emperor Norton to Marilyn Monroe to Michael Jackson – the fame mixed with exploitation and tragedy. Do stars affect a persona, which we think is the real them, so they become that persona more than their real, private selves? 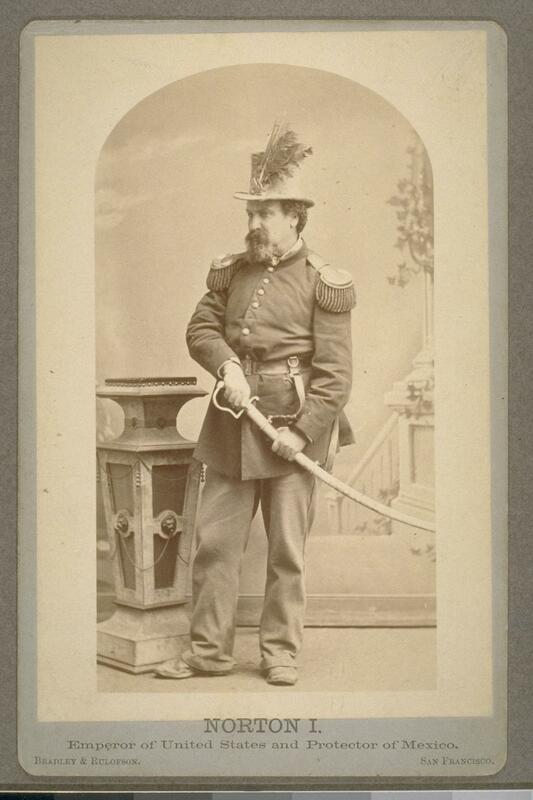 Or maybe Emperor Norton is closer to today’s reality stars who blur the lines between the self and the performance. Was Norton a pre-Real World/The Hills/Made in Chelsea presentation of the self, projecting out something he knew the public would want to see, something that would raise his status (or at least visibility) in the community. There is an unsettling oddness to living out a version of yourself that is really a fictional construct. I guess we all do that to some extent, at least in certain contexts. But to do it all the time seems sad – the persona less as a protective shield and more as a comment on the lacking of your actual personality. When you have nothing left to sell, do you sell yourself, or do you sell “yourself”? Maybe what makes characters such as Emperor Norton so compelling is that we can project our own thoughts and theories and prejudices upon him. He is whoever we want him to be. He is unknowable, so we can make of him what we will. We can play his story as a comedy or a tragedy. We can see his community as understanding and caring, or manipulative and eager to seize on an opportunity. We can view him within the context of wider celebrity and what is says about those who want to be in the public eye, and those of us who just like to gaze. Maybe this is why so many public figures are compelling. And why celebrity, in all its forms, is nothing new. This post was in response to Mike’s idea to write a profile. Lovely post. Again, I humbly request more like this one. This is how I felt about Tommy Wiseau, writer/director/star of The Room, which if you haven’t seen yet, what the hell are you doing reading this comment and not downloading it now?!? He laid himself emotionally bare and put out a train wreck of a movie and now has a monstrous fan base (including myself) who anticipate every announcement of a new get-rich-quick promotional scheme. Like the Emperor, much of Tommy Wiseau’s fame comes from his outsized personality. Sure, maybe both achieved their fame through delusions of grandeur, but they were able to hold on to and even gain fans after the original hook. Eventually the joke has to wear off, and what we’re left with is just fame and admiration. Maybe they didn’t get famous by the path they would have chosen, but they did get what they wanted in the end. Cheers to them, I say!